Shaped like the head of Mickey Mouse, cute and lovely decation on your wrist. 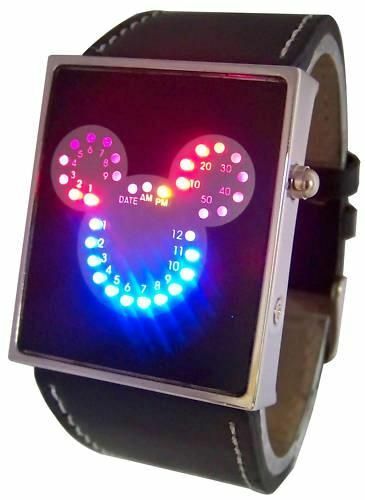 It has 29/33 Super bright LED lights that display the time as well as the month and date. It can display time automatically every 10, 20, 30, 40 or 50 minutes and animation, it can adjust bright degree. Press the button at the side once will display time: the blue LED line (Mickey’s face) means hours, and the red lines (Michey’s ears) means mintes. Meanwhile the AM or PM LED light, it means AM or PM now. Press the button at the side twice for month and date: the blue LED line (Mickey’s face) means months, the red lines LED line (Mickey’s ears) means the dates. Meanwhile the DATE will light. Case size: 3.5 cm x 4.0 cm approx. Band width: 2.5 cm approx.